I have to work without a light and I’m scared. I go at 4 and sometimes half past 3 in the morning and come out at 5…I never go to sleep. Sometimes I sing when I’ve light, but not in the dark; I dare not sing then. I don’t like being in the pit…I would like to be at school far better than in the pit. Sarah Gooder, 8 years old. Extract from UK Parliamentary Papers, 1842, vol. XV-XVII, Appendix 1. For centuries it was common for children to work helping their families on farms or in cottage industries with specialized crafts such as weaving. Children would not receive a wage for this work because it was viewed as contributing to the family economy. The nature of work changed during the Industrial Revolution. New factories, mills and mines opened in Britain and instead of working at home with their families children would be sent out to work. Initially child workers were drawn from local orphanages and workhouses and were given food and dormitory lodging in exchange for their work. They did not receive a wage. As more of the new workplaces opened and grew bigger they needed more workers, and so started to employ children. Families sent their children to work in factories, mills and mines because they needed the money. 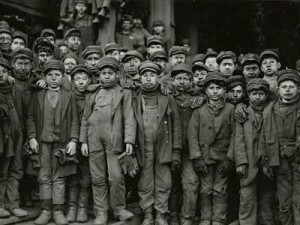 The average working class child in the period 1791-1850 started work at age 10 and by the 1820s 60% of 10 year old and 30% of 8 year old working-class boys were employed. In the coal mines the average age of beginning work was 9. Children as young as 5 or 6 would work more than 12 hours a day for 6 days a week and the work was often very dangerous. Many young children were killed working or cleaning huge machines, and often got very sick from working in the mines or dealing with dangerous chemicals. 1833: Minimum work age is 9 in all large factories. Children aged between 9 and 12 may only work 8 hours a day, and have 2 hours of compulsory education. Check your knowledge, download the Child Labour in the Industrial Revolution worksheet here. The experience of men, women and children during the Industrial Revolution, and their changing way of life.